True, guessing an adult dog’s weight by their puppy weight is a bit of a challenge… kind of like guessing an adult human’s weight by how large a child they were! These guidelines, however, at least gives you a start. Puppies at different ages grow at different rates, and puppies of different breeds grow at different rates. Studies indicate that you can expect a small or medium breed puppy to reach 99% of it’s adult weight somewhere between 9 and 10 months of age. 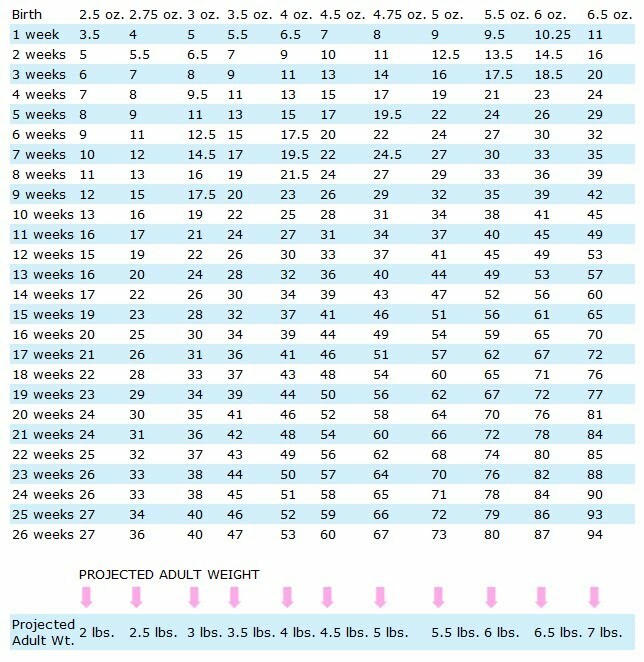 Remember, this is only an estimate and it is impossible to predict the adult weight of a puppy. This is a good tool but the actual weight of your puppy can and probably will vary. Toy to Small Breeds – weight at 6 weeks x 4 = adult weight. A pup will be between 2/3 – 3/4 of its adult weight at around 6 months of age.